As a disclaimer, I should mention that, like many of the better things in life, the Big Kid Hot Chocolate recipe is pretty simple (despite Phoebe’s latent desire to somehow make it into bruschetta or a crostini). But this recipe also involves a lot of gut feeling and improvisation, so if you’re fully sober while you’re making this concoction, you’re missing out on half of the fun. The biggest question before we start is to determine your desired effect. i.e. how drunk you want people to get. Since it’s her blog, I’d like to put it on a scale of “Phoebe snorting a bit more than usual when she laughs” to “Phoebe bumping into walls and not talking.” I generally aim for something in between, but add less or more vodka as you see fit; either you’re hoping for a quiet night with friends, or a room full of beer tears and morning-after regrets. Fill the biggest pot you’ve got 2/3’s of the way with water and put it on medium heat. Dump in ¾’s of the hot chocolate mix and stir to incorporate. Bring to a boil and then return to low heat (don’t add in the alcohol until it’s on low heat or it’ll burn off). When the hot chocolate is cool enough to drink, pour in the full bottle of Bailey’s and some of the vodka (about ½ a handle should do the trick). Give it a taste. If it’s a bit watery/vodka-y, pour in the rest of the hot chocolate mix. Stir and add any additional vodka you see fit. Then let the good times roll. 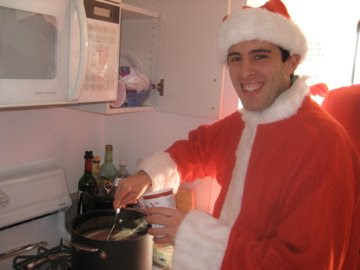 Big Kid Hot Chocolate: best enjoyed while wearing a Santa suit. Or in drag. Is the Nesquick made for mixing with water? Or could this also be made with milk?